A Virginia judge declared on Tuesday that the black tarps covering two Confederate statues in Charlottesville, Virginia should be removed in the next 15 days. Judge Richard E. Moore of the Charlottesville Circuit Court ordered the city to remove the tarps covering the statues of Gens. Robert E. Lee and Stonewall Jackson, which have been shielded from the public for six months following the violent, deadly clash between white nationalists and counter-protesters last August, the New York Times reports. City officials initially covered the statues for a period of mourning, but Moore said it did not appear the city had any intention of removing the dark shrouds from the statues. He said it is "not a matter of the ‘mourning’ having gone on too long," but rather, a matter of visitors and historians not having been able to view the monuments in months. "Their lost opportunity cannot be undone," Moore added. City spokesman Brian Wheeler said they would comply with the judge's orders but would not specify a date for when they would remove the tarps. He said police officers were patrolling the area around the monuments Tuesday evening in case people tried to remove the tarps on their own, the Times reported. 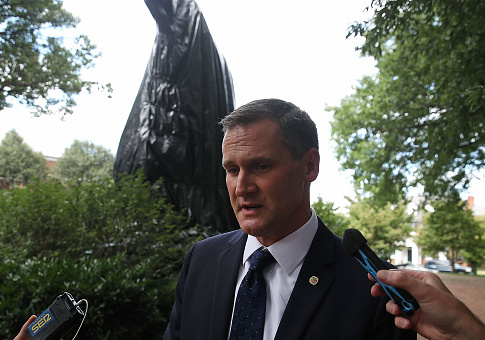 The judge’s order was a small but significant development in a nearly yearlong legal battle over the future of the two statues, which were erected in separate public parks in the center of Charlottesville in the early 1900s. Months before the white nationalist rally, the City Council voted to remove the Lee statue, as well as to redesign and rename the park with the Jackson monument. That decision led several groups, including the Virginia Division of Sons of Confederate Veterans, to sue the city last March to block those efforts. And over a weekend last August, hundreds of white nationalists flocked there to protest the removal, waving Confederate flags and chanting Nazi-era slogans as they marched through the University of Virginia campus and converged on Robert E. Lee Park. A day of clashes between the group and counterprotesters grew increasingly violent, resulting in the death of a woman when a man drove a car into a crowd of counterprotesters. After her death, the City Council voted to cover the two Confederate statues out of respect. Before his ruling, the judge had denied previous attempts to force the city to uncover them, saying that they could remain temporarily. But Judge Moore scolded city leaders on Tuesday for what he called an "after-the-fact attempt" in recent weeks by the city to claim that the plan had always been for the shrouds to stay for one year. "The harm to defendants from removing the tarps and not being able to shield them until the matter goes to trial is outweighed by the harm to plaintiffs and the general public in not being able to view or enjoy them," Moore wrote. The ultimate fate of the Confederate statues is not expected to be decided until later this year. This entry was posted in Issues and tagged Charlottesville, Racism. Bookmark the permalink.